Small to medium brown leaf spots with purplish margins. Lesions on succulent green stems. 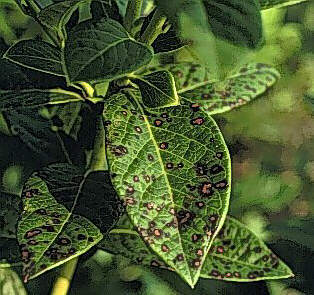 Leaf spot infections occur on immature leaves. Symptoms may take a month or more to become visible. Most leaf spots begin to appear in mid- to late season and are favored by wet weather. The causal fungi all produce rain-splash-dispersed spores and overwinter in infected tissues. Reduce humidity in the canopy. Apply effective fungicides before the onset of symptoms. Alfieri, S.A. Septoria Leaf Spot of Blueberry. Retrieved 15 April 2010.